We have trillions of bacteria lining our digestive tract, both good and bad. Probiotics are often referred to as the “good” or “helpful” bacteria because of their overall supportive role in helping to restore the composition of the gut microbiome. They do so by creating an ideal environment and introducing beneficial functions like nutrient absorption, healing of digestive tissues, supporting overall brain health, and helping to fight certain allergic conditions and infections. 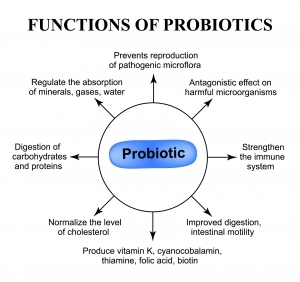 In general, probiotics seem to improve overall health, metabolism, immunity, digestion, and body composition. They may even help alleviate inflammatory conditions. Many types of bacteria are classified as probiotics. They all have different benefits, but most of them come from two groups, Lactobacillus and Bifidobacterium. Lactobacillus is the most common probiotic, it’s the one you’ll find in yoghurt and other fermented foods. Bifidobacterium can also be found in some dairy products, it may help ease the symptoms of Irritable Bowel Syndrome (IBS) and some other conditions. Check out a food or supplement with probiotics and the label might say something like “Lactobacillus rhamnosus GG”. The first name that appears is the genus (Lactobaciullus). The second name designates the species within the genus (rhamnosus) and the third name or number that appears is the specific strain within the species (GG). 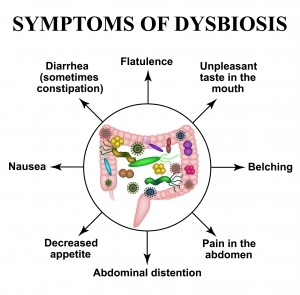 Symptoms of Intestinal Dysbiosis. Dysbacteriosis of the intestine. The large intestine. dysbiosis of colon. Bacteria, fungi, viruses. The human digestive tract contains about 400 different bacterial species that reduce the growth of harmful bacteria and promote a healthy digestive system. Lactic acid producing bacteria are by far the largest inhabitant group amongst all. Given the pressures of a modern lifestyle, the maintenance of a normal, healthy and balanced microbial population in the digestive tract is a difficult task. Additional factors that might make this task even trickier are stress caused by sudden changes in food consumption patterns, exposure to environmental pollutants, extensive travel and unexpected changes in weather. Therefore, under such adverse circumstances, the harmful bacteria may become predominant (a condition referred to as bacterial overgrowth) and create an imbalance, which may in turn impair normal gut function and lead to various problems, ranging from inefficient digestion, diarrhoea, constipation and flatulence to severe gastro-intestinal disorders. One important feature of a healthy GI ecosystem is balance. When good bacteria flourish, bad bacteria and other microorganisms such as yeasts and fungi are pushed out. Probiotics can help replenish and nourish this internal supply of good bacteria. Most probiotics are created via fermentation; fermentation not only bumps up the good bacteria but also helps to eliminate anti-nutrients. 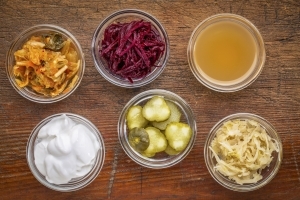 Probiotics can be found in certain yoghurts, buttermilk, kefir, fermented sauerkraut, kimchi, fermented pickles and bacterially cultured cheese. Traditional methods of meat preservation (such as curing of salami) also use fermentation of Lactobaclli to preserve food, although arguably industrially processed cured meats no longer have health benefits. If you are otherwise healthy, aim for 1-2 servings of probiotic rich foods each day. If you’re hoping to prevent or alleviate a medical problem, you may need to increase the dose. Research has also shown probiotic supplementation to be an effective way of supporting a healthy gut. Supplemental doses are typically expressed in billions of live organisms. Between 3 and 5 billion would be a starting dose. This could be increased to 10 billion if you are hoping to alleviate a specific health concern.